Certain holes provide you the chance to catch a “ramp” to propel your drive otherworldly distances. You’re looking for an uphill shot where you can play a medium-teed A1 or C3 driver with roll, especially with an outwind helping up the ramp. Curve your shot into the upward slope and hopefully you’ll catch this ramp feature where your ball continues to skip along up the hill and shoot forward a really long ways! Here’s the ultimate ramp shot — the longest ace in GT history on Juniper #16! 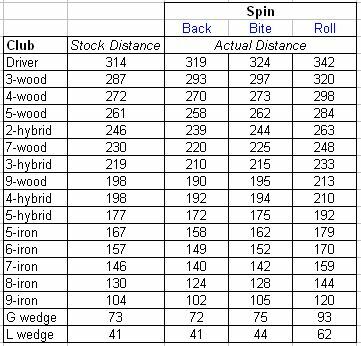 Thanks to Jed Donnelly who ran an experiment, we have a nice visual showing about what you can expect when driving the ball with different clubs and high/medium/low tees. Take a look at the picture below to see the different loft comparisons for the driver, 3W and 5W! Although this “feature” has been in existence all this time, it wasn’t widely known to the Golden Tee community until 2016. It has specifically been showcased on Elkhorn #1, enabling enlightened players to drive this green under otherwise impossible circumstances. If you’re able to pull it off, you can add quite a bit of extra distance to your drive. Due to a glitch in the software and the mechanics of the trackball during an A1 shot, players have figured out a way to boost their drives by 50 yards or more if they can pull off this shot. It’s difficult to explain and tough to execute on a consistent basis. It can be done with any trackball, but it’s more difficult to execute on a smoother ball. The specific spin angle which “loads” the shot can also vary by trackball. So how do you do it? Without sufficient personal experience, here is a collection of advice and instruction I’ve gathered that can help you experiment and hopefully figure this thing out. Please feel free to share any more tips or clarification that can help our community! Start by pulling “full A”, which means above the A, almost sideways, and then stop the ball. Now start spinning towards the full A and start working your way down towards normal A until you find the angle that works. Keep spinning the ball as you try different angles between full A and A. You’re keeping an eye on the club above your golfer’s head, and what you want to observe is the club head dropping a tad and then popping right back up to the top, kind of like a pump fake or a bobble. When you see this happen, the shot is “loaded” and you’re good to hammer it out to 1 to achieve the turbo drive. Here’s one video — notice how the club head drops ever so slightly after some of the spins to A…when you get this to happen, you’re good to go…players like to spin a few more times and then hammer it out to 1 for the shot. Here’s a much more efficient example with a trackball and a screen view. You’ll notice in the video that he uses a consistent speed and rhythm while looking for the bobble. If the club head starts coming down, that’s not it — the actual motion you want to see involves the club dropping down a pinch but then returning to the top. You may not know how many spins it takes — it can happen immediately or after a few spins. You’re just looking for that “blip” of the club. If it quickly twitches, spin it another time or two and let her rip towards the 1. If the club drops more then a twitch, you should start over. Hit the spin button and repeat the process. Or, if you don’t see it happen after 15-20 spins, then stop, start over and try again. Patience is key. Furthermore, if you can get the club head to pop a second time, it will go even farther. I think this is about finding the right angle on your particular trackball that activates the feature, and exploiting it to your advantage. Elkhorn #1 is the best place to try because there’s no penalty if you don’t get it. A normal drive is just fine. But above and beyond this hole, you can start to see how this drive can be applied to numerous other holes. Another caution about what you DON’T want to see, which is the club head coming all the way down during this process. That can result in a tragically SHORT drive, so just keep an eye on what’s happening with the club head, and keep practicing and watching your results. Since the YouTube era of Golden Tee began a few years ago, we’ve seen plenty of amazing hole-outs. It’s a fairly small group, however, who have made their way to the top of the Great Shot points list for a single stroke by finding the hole off the tee from 400+ yards out. This post is dedicated to those LONG holes-in-one — enjoy! Plenty of distance on this sick shot — too bad the hole wasn’t farther away! OKAY — now the 400-yard club! Auburn #2 has had many over 400, but here are three of them, started off by a 3-wood that’s fun to watch and ending with a 413 yard ace to a back pin! Here are a couple on Falcon #6 that flew 410! I love this one from Timber and how it carried all that water! Mr. Tansy hit this one during classic course week at Heather Pointe — heck of a way to start off a round! Stu Fox has hit a 430-yard ace on Highland #10! One day later, a 448-yard ace was hit on the same hole!! Andy Haas on Elkhorn #1 from 451 yards away! Justin Clark on Elkhorn #1 from 459 yards! And here it is — the incredible ramp shot on Juniper 16 that comes in hot to the cup from 479 yards!! If you’ve got any more 400+ yard drives to add to the list, let me know — and I’ll keep this post updated as new seasons roll on and even more long drives find the cup! With the luxury of a Golden Tee Home Edition, I was finally able to compare club-for-club how tee height and spin affect your distance off the tee. This article will show you how much distance you can expect to gain or lose with each of these options. First, let me explain how I set up these experiments. I needed a hole with a long, mostly flat fairway from this year or last so that I could use tees. After poking around, Falcon Sands #9 seemed like a good candidate. It’s a par 5 with a big fairway straight ahead to start off. I made sure the weather was perfect, so remember that as weather worsens, so does your distance once the ball hits the ground. This fairway was not totally flat — no fairways are. So, little mounds here and there may have affected distance. Finally, there was a small 3MPH wind that may have affected distance a couple yards. All these shots were “firm” B2 shots — straight back to B, and forward to 2 hit fairly firm. I figured this represented the skill of an amateur player who plays several rounds per month. Beginners will likely see less distance, while those who can execute a smooth hammer shot will see greater distance. I attempted each shot until I was comfortable that it was struck with the same consistency as the others, but human error will likely see a variation of a couple yards here and there. I used both the Flares and the Hawks with the Hurtles for this setup. In general, more loft = more roll! Perhaps this is due to more bounce when the ball hits grass due to the loft and angle of descent, as opposed to the friction of low-lofted shots running along the grass and slowing down. Overall, distance decreases 4-5% with woods and 5-7% with irons. As with curve shots, irons generate more spin for roll and backspin. Same for driver and 3-wood. For long drives off the tee, you’ll only see more distance with a high tee vs. roll if you have a big tailwind. The other woods will give you 3-4 more yards with roll vs. high tee. You’ll get 5 more yards out of the 2-hybrid with roll, but you’ll get 10 more yards out of the other hybrids. 5-9 irons show about the same distance. Wedges will get you a few more yards with roll. Backspin gets you a few less yards than a low tee for the woods; a 9-wood is about the same. Backspin is a couple yards longer for hybrids. Backspin is 4-5 yards less for medium irons and wedges. Backspin is a couple yards less for high-lofted irons. Most players hit farther than the given “stock” distance. A firm B2 shot with bite is the closest thing to that distance. High tees are most effective with high-lofted clubs, while low tees see a fairly consistent decrease in distance across all clubs. Roll is also most effective with high-lofted clubs, while the effect of backspin is noticed the most with irons. For most clubs, roll gets you more distance than a high tee. A high tee may still be longer with a big tailwind. 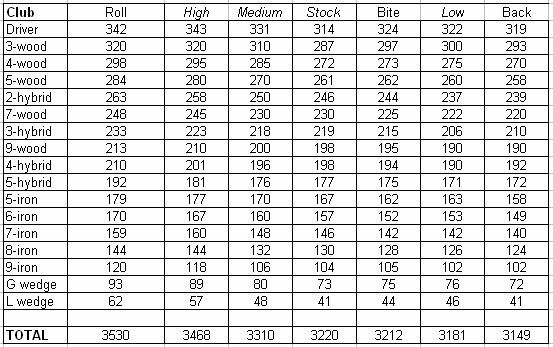 For the full set of data, click here to view the spreadsheet! Hopefully these experiments helped you learn a thing or two to help manage your distance off the tee, and also with approach shots into greens since the effects of spin will be similar. 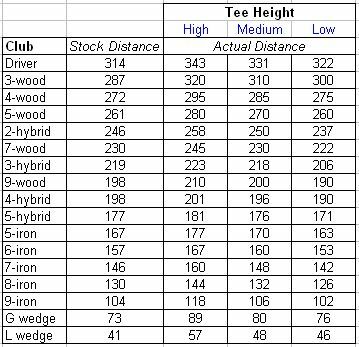 If you use a “high tee” your club will go one bigger club further, and one shorter club higher. For example, A high-teed 3-wood will go as far as a driver, and as high as a 5-wood. This will help when getting over trees and going a long way, such as hole #9 of Laurel Park. CAUTION!!! A high tee will have backspin or topspin reduced to 5-10% of what you’d see with a normal tee. Also, backspin still creates a bit more loft, and roll creates a bit less loft. In reverse, a low tee will go one club shorter for length, and one club bigger for height. 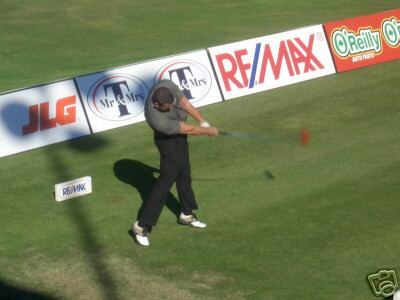 For example, a low-teed 3-wood will have the distance of a 5-wood with the height of a driver. This helps getting through the pyramid on Falcon Sands #14 (a 2-iron low tee topspin through the hole works often here). Expect backspin and roll to be increased 20-25% from what you’d see with a normal tee. Also, backspin still creates a bit more loft, and roll creates a bit less loft. Go ahead and “waste” a tee off the first hole to get a feel of how much further a high tee will go. Then you’ll be ready when you need one . Also, we recommend playing Hawks and Hurtles on ALL courses until you’re a 23 handicap or better consistently! As in real golf, most guys like to show off their long drives on Golden Tee. It’s usually beneficial to be able to crank out a long drive, because that may make the difference in whether or not you can reach that par 5 green in 2 shots. But as the game has evolved, driving accuracy has become immensely important as well. This section contains some tips to help make sure you always leave yourself a good, open second shot. The first step on any hole in Golden Tee is to figure out how you’re going to get to the green. Be creative! Driving down the middle of the fairway is not always the way to get you to the green in the least number of strokes. On Par 4s, an important tip is to always check to see if there’s any way to reach the green with your drive. Maybe you can hook the ball around those trees, maybe you can hit over that building that looks too tall, or maybe all it takes is a good, accurate shot into a reachable green surrounded by water. If you determine that it’s possible to reach the green on your drive, the next decision should be whether or not you want to go for it! How aggressive or conservative are you feeling? There are times in Golden Tee to lay up and times to go for it, but those depend on your current situation! On Par 5s in Golden Tee, you’re looking to see where you can drive the ball so that you can reach the green on your second shot. Sometimes you just can’t, but often times you can. Maybe you have to land the ball on a little island, maybe you have to hit off into the sand, maybe you have to land it in an area where your next shot will thread the needle between some mountains, or maybe you just need an extra long drive to clear that second lake. Again, use your imagination, and then figure out if it’s worth the risk! If you’re curious, give it a shot – you won’t know until you try! Better yet, tell your buddy to tee off before you to go for it! Once you figure out where you want to drive the ball off the tee in Golden Tee, it’s time to figure out the best shot type to get it there. Are there trees in your way? Which way and how strong is the wind blowing? Can you hit it straight, or do you need to hook it? 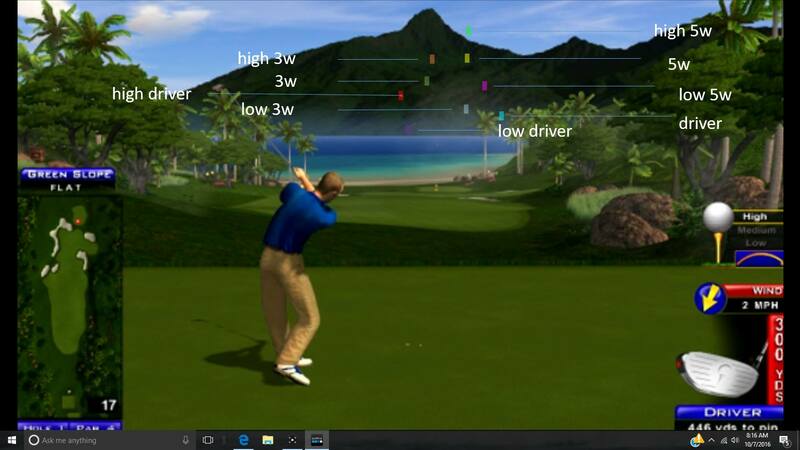 Do you need to maximize distance? Do you need to hit it as close to the water as you can if you can’t clear it? 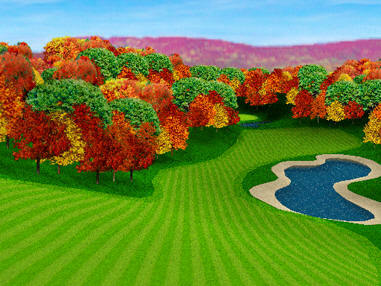 Visualize the flight of your ball to the landing area. Also realize that if you plan to pull the trackball back first, you may be sacrificing some accuracy, but you may gain some distance as well. A great tip I use is if my landing area is pretty thin, I’ll just crank the ball forward against the direction of the wind so that it lands where I want it to. Review the shot types in the section on “Using the track ball”, and figure out what you want to execute! Next, determine if you want backspin or roll on the ball (review the section on “Backspin and Roll”), and make sure you’re accounting for the wind! Finally, execute your shot and hope for the best! It takes a lot of practice to get the ball to land exactly where you want in Golden Tee, so take notes in your head on what you did and what the results were so you can improve upon or do it again next time! I’m no expert on this subject, but I know about it from reading forums. The best Golden Tee players can crank out 400+ yard long drives with regularity, but I’m not one of them. The secret lies in the big-hooking A1 and C3 shots. If you can visualize a clear path where your drive can take this kind of angle, then a good tip is to shoot one of these shots off the tee for maximum distance. The ball just travels a lot farther, and by using a big hook, you get a ton of roll on the ball as well. Here’s an example video showing the execution of this shot. If anyone has any comments to help out here with long drives in Golden Tee, I’d love to hear them! I hear this from more and more guys, and it’s something I need to start working on more. The Golden Tee concept here is to take the wind direction and pin placement into consideration before cranking out your drive on an unreachable par 4. You want to put yourself in the best position you can to stick your upcoming approach shot by the stick. So, the tip here is to try to give yourself as much green to work with as you can, and try to position your drive so that you have as little side-wind as possible. Having an approach shot in Golden Tee with very little side wind and green to work with greatly increases your chances of leaving with a tap-in birdie, not to mention giving you a better shot at holing out!